Yesterday we had a team of six second year BA Film and Television students from the University of Arts London in the shop. 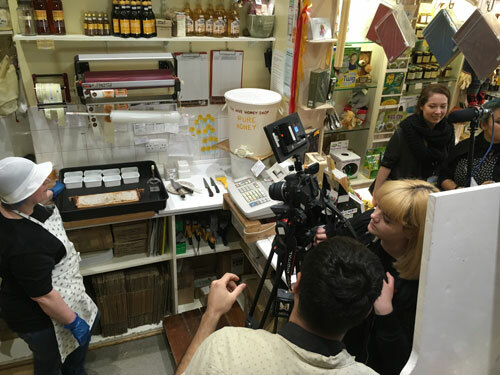 They asked if we could help them with their film project “What’s the Buzz”, a 10-minute live multi-camera documentary filmed in our shop and their TV studio on campus (London College of Communication). With it, they are hoping to educate people on the different uses of honey and the importance of bees towards the environment and consequently, us. It will feature illustrations and facts about the history of bees & honey as well as the impact they have on our lives and future. They have asked James, our Master Beekeeper to be their on camera host guiding us through the programme and using honey from your our shop to use for different recipes. We were happy to help and they were very professional on the day. We next do the campus studio filming in June. Once complete we will share their results with you via our video website link via Youtube.